Talking about writing and writing for children at that, I can’t get out of my mind these lines that I read years ago: “How do you write for children? Just the way you would write for adults. 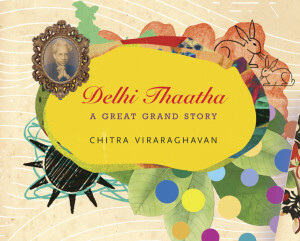 Only better.” Chitra Viraraghavan, a Ph.D in English from Boston, a teacher of English, a book-editor, school textbook writer and a writer of adult fiction, has done just that, written the book Delhi Thaatha from the perspective of her curious seven-year-old self. And what does the seven-year-old share with her readers? The face of her great-grandfather – her mother’s mother’s father – private and public woven together. Here’s the opening bit from the book: “I call him Delhi Thaatha. But he lives in Madras. And he isn’t my grandfather. He’s my great-grandfather. Here is his house.” Juxtaposed to the text in the pages is a double-spread picture of the frontage of a large house that you can still see as you pass it by on the road leading to the Gandhi statue on the Chennai beach. Now, what was Thaatha like as a child growing up in the 1890s in Tiruttani, a temple town about 90 kilometres from Madras? What was Delhi Thaatha’s profession? Why the prefix Delhi? How did the world perceive him? How did he become what he became? How did the little girl relate to the grand old man during the late 1960s? ‘Seven-year-old Chitra’ answers these questions and more. And how does she catch the attention of other children? Through pages brimming with colour – rare B&W photographs, illustrations, sketches and paintings in a variety of hues. Here are some clues to find out Delhi Thaatha’s name: He went to Madras Christian College, taught at Madras Presidency College, was an academic, known the world over having taught in the UK and US, wrote books on Philosophy, spoke in forums like the United Nations and as a result of his achievements became India’s first Vice President and second President. His birthday, on September 5, is celebrated as Teacher’s day in the country. The road on which his house (Girija) stands is named after him. Yes, Sarvepalli Radhakrishnan. Chitra answers questions on the story behind the making of the book in her longish note at the end of the book. Artist P. Balasubramanian and graphic designer Sunandini Banerjee have worked with her on the book.